There appears to be a dearth of new cars this year. Fiat have nothing much to show for themselves. Lancia are again not presenting anything new and nor are MG, Hillman or Rover. Hybrid variants, re-showings of electric cars, tuned models and some facelifts make up the bulk of the products being touted for our delectation. It’s rather telling that I had to nervously snack on five crackers, some Camembert and a glass of vegetable juice before finally forcing myself to write. Chopping the roof off opens the Smart ForEase to the world, revealing an interior whose nod to show car glamour means excising 35 degrees out of the steering wheel rim. The upper IP is in glare-in-the-windscreen white. I am not sure how serious this idea is: it echoes the 2002 Smart CrossBlade and the 2012 ForSpeed concept though its styling is toned down. The colour and trim people remained on a short leash for this one. Nothing inside is much different to something already on sale somewhere. While the 2017 Camry is not big news, the Mondiale is part of the model’s triumphant return to Europe so we might as well have a look at the interior. That red shape running over the front passenger’s legs doesn’t do much, does it? It is the remains of a form that never existed on the symmetrical version of the IP. There is a plastic strip running from the cup-holders up to the instruments panel which ends abruptly. They are trying though. I think I quite like this even if it doesn’t pass the Rams Test. And the exterior is a rather long, low, wide vehicle where WakuDoki remains as more of an accent, much better integrated than on the outgoing Avensis (may its name be hallowed). Is it me or do the two cars look like contemporaries and not two different generations? The evolutionary design carries over such familiar features as box pleats, colour coded centre arm-rest and the traditional three-spoke steering wheel. Floor mats will be available in Spring. The seating is notable for not looking as much like standard car seating as is normally the case and also not looking like concept car seating either. The pleated sections suggest the 1970s even if you may actually have a hard time finding the precise inspiration for them. Even more striking is the use of rich blue velour which has the wonderful property of reflecting either rich tones of very pale areas, creating considerable optical interest. I don’t know if such a material can be made with a Martindale value as high as the drab wovens we have been getting for much of the last two decades. The double A-pillar will be familiar to drivers of the Citroen XM, and it creates a very spacious interior ambience while also affording a clearer, less-obstructed view out. Even if the eLegend never makes production in this form, Peugeot say there are many elements that should make production. One of them must be rich velour upholstery. The arm rest is colour-coded. Is it? In what way? It’s the same colour as the seat. Ah. Shouldn’t that be ‘co-ordinated’ then? It could be, yes, I suppose. I’d say it should. “Colour-coded” means something else I think. Yes, it usually refers to outside colours. Er, no. You’re missing the point entirely. Renault showed the EZ-Ultimo (the name is not tasteful): “A large armchair and a deep two-person bench are covered in velvet and there is parquet flooring,” writeth Autocropley. Seats a bit like this (but obvs w/o head restraints) were used in the Ogle 1.5 in 1959. A 1985 Buick Le Sabre. I rented one of these in the US way back then. I’ve seen those integrated headrests on the Peugeot eLegend somewhere before, but can’t remember where. It might come to me. Doesn’t colour-coded usually mean when two different materials (e.g. steel bodywork and plastic bumpers) are matched? That LeSabre looks very inviting. It also looks like a high-quality item, within the terms of its æsthetic approach. The headrests are just another re-interpretation of the Peugeot back-catalogue. I’ll see if I can find a picture. Mm mm, oh yeah. The fuzzy black dice hanging from the rearview mirror is always a sign of pure taste. Not to mention the apparent acessory tachometer leaning up against the left A-pillar for those exciting runs to 4200rpm! 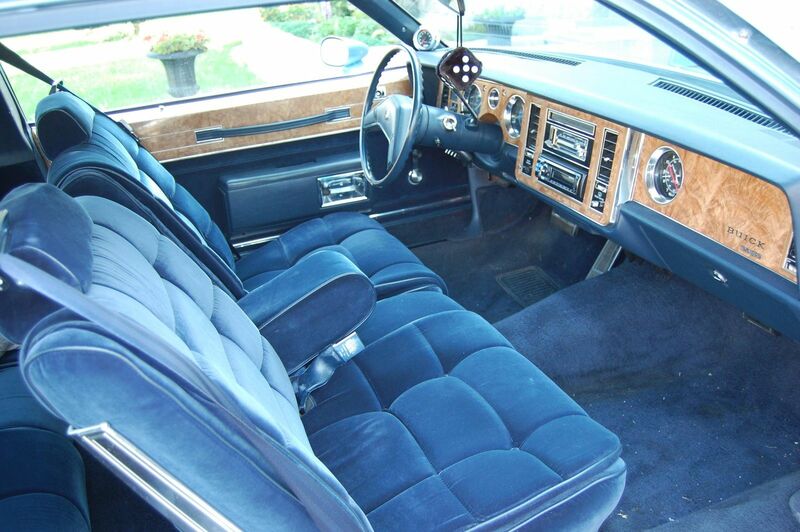 The doorpull in the faux woodtrim under the driver’s window was a GM original. Guaranteed to pull away from door in time, nobody could ever predict when, held in place as it was with two sheet metal screws and dealing with a door of great weight and door detents designed by a 17th century blacksmith. BTW, those headrests are in their bottom position. Few bothered to adjust them properly. That’s the one. Well done, Laurent. I’m here to help, and I aim to please. Re the 504 seat I seem to remember when the head rest was up the void in the back rest was somewhat uncomfortable so as a result I never raised them. Also, the stepped black plastic panel that is exposed when the headrest is raised is less than pretty. The new Camry is on the TNGA architecture, the old one’s platform was approaching two decades of faithful service. When you get to examine a new Camry grille and interior in the flesh, I’m in no doubt the astounding quality and fit ‘n finish will render you speechless. I am not Camry-ologist. The way the new Camry was explained plus the variety of images at different sites made it very unclear. The Toyoya EU site still shows the old Camry (I think it is the old Camry), Autocar said the EU Camry has been on sale two or three years but showed the brown metallic car. Another hour of research would have solved my uncertainty.